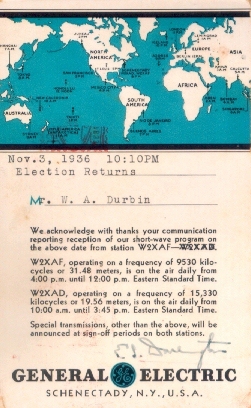 QSL card from W2XAF, Schenectady, N. Y. for a report of 3 November 1936 on 9.590 MHz. A number of USA short wave broadcast stations operated with amateur-like calls up to the 1940s. The "X" after the prefix denotes experimental broadcasting station. Thanks to Richard Jary for this classic.